Send a message to each person on your diary at the same time. This could be to remind of a delivery, or maybe an engineer visit. Send to everyone or group by job type. 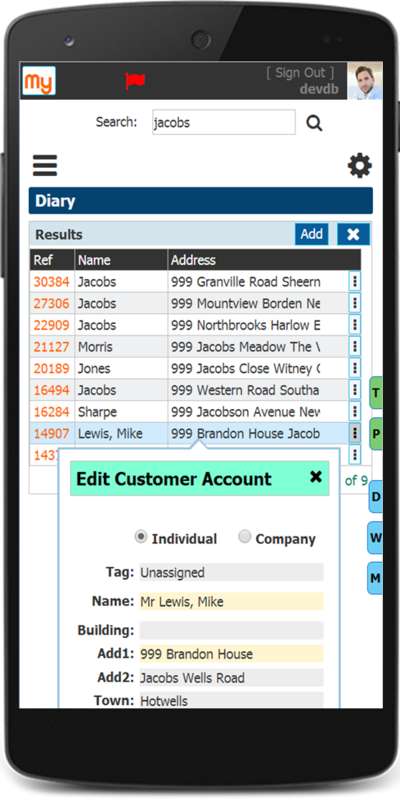 With My Field CRM SMS text messaging capability, you can easily send a message to all of your contacts at the same time for each day on your customer diary. This could simply be an alert text message that one of your service technicians will be arriving shortly. Or a sales reminder that allows your customer to text back with confirmation. 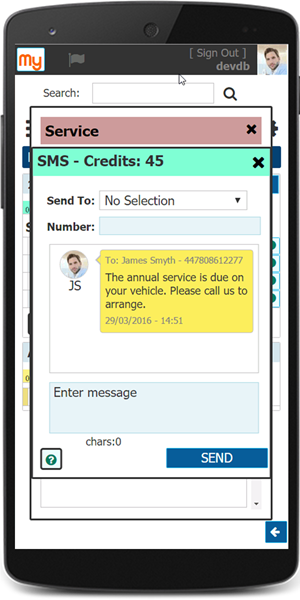 Whatever your requirement for keeping in touch, My Field CRM SMS service is an ideal tool for the job. By sending a text message, you can be almost certain that someone will read it. Unlike email where the message may not be read immediately, or worse falling into a spam folder! 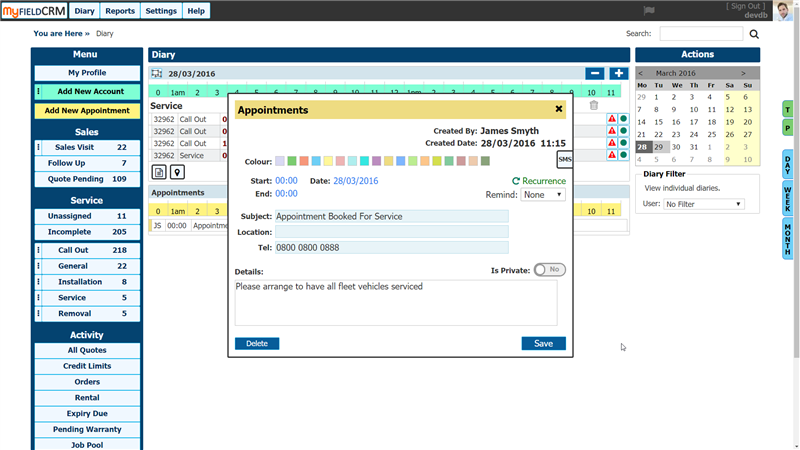 Appointments diary shows bookings and appointments for sales and service engineers or general appointment booking. 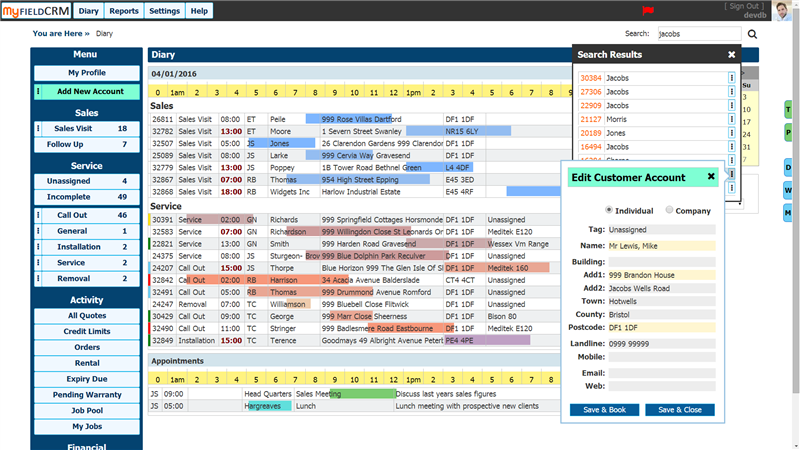 Scheduled by day, week or month with drag and drop capability to easily re-book your appointments. 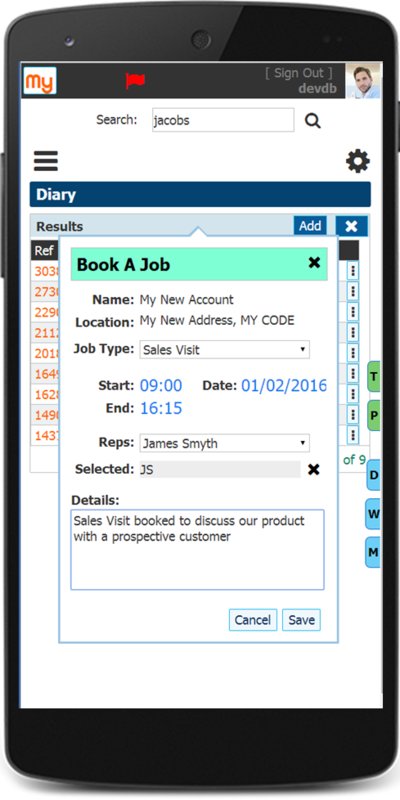 The Appointment Diary shows all bookings and jobs scheduled for your site technicians and sales team. Whatever appointments you book will appear here. From customer sales appointments to field service jobs, they are all easily filtered by day, week or month. Further, you can view each sales rep or service engineer diaries separately. If you search for a customer account, this can be by name, part of the address or even the telephone number. Results are easy to find and filter, making locating your customer details a simple task. To change a booking, simply drag and drop the appointment to a new date and the job is done. You can set personal reminders that only you can see, or target certain users. With My Field CRM there is always a choice with how you want to work. Setting recurring entries on your diary or timed notifications is simple. There is no need to ever miss another appointment. Search for any part of the address, name or even the invoice number will find the record you are looking for. If it's a broad match search, I.E. lots of records are returned, simply use the instant filters built into the search facility to reduce the number of matches instantly. Customer search works on any field using your desktop or mobile device. Simply enter any part of the name, address, phone number etc. My Field CRM will find any match to the record you are searching for. Results are easy to find and filter, making locating your customer details a simple task. To reduce the number of matches filter by name only or reference number. If you want to filter only on invoice numbers? you can do that too. Filters can be added and removed instantly without creating a fresh search. If you want to limit the types or records that an individual can find, this is easy with My Field CRM. Simply set the access rights to only allow the records that are required for each user. Once this has been set, the user will only get results based on your privilage settings. 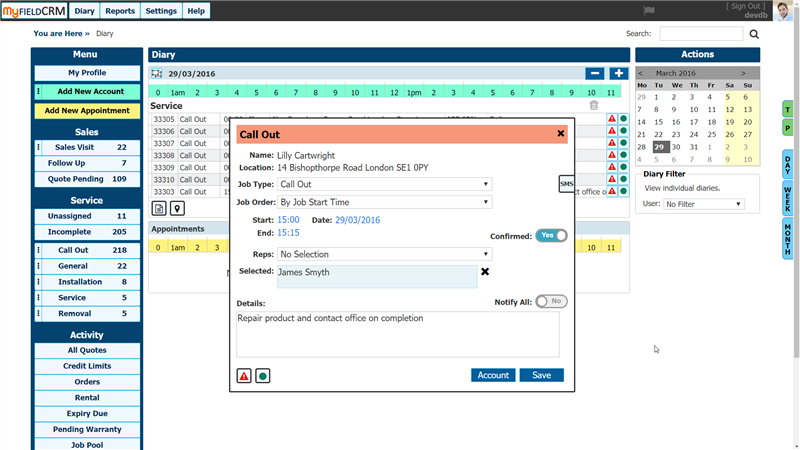 Booking on-site visits or sales appointments using the appointment diary is done in seconds. Create a new customer then book an appointment in one go. 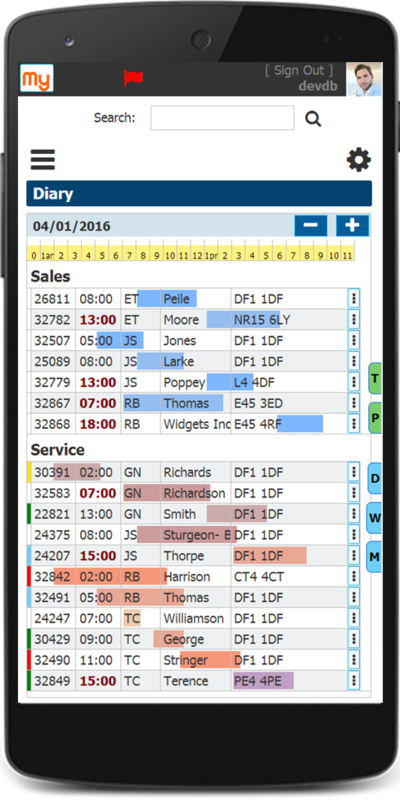 Search for an existing customer and arrange a visit for your sales team or service engineers directly from the appointment diary. From the Appointment Diary, Booking a Sales Call or Service Engineer Job can be done by either creating a new customer or searching for an existing one. From the menu, an appointment can be created in a matter of a few seconds by using the easy to use pop up dialogue boxes that give you all of the options required for making that booking. 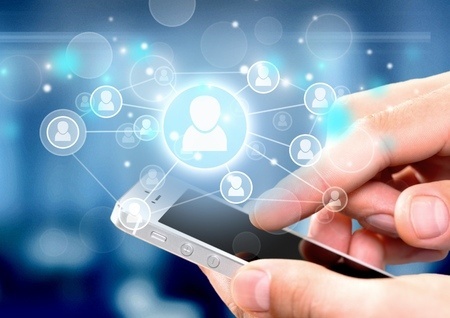 Just as you can on your desktop computer, booking a site visit or sales appointment is done in exactly the same way using your mobile device. All of the functions you see on a big screen are also available on yur smaller mobile screen. Text messaging is a powerful marketing tool. Text messages get read! it's a certain method of ensuring your message gets to the people you want to read it. Our SMS text messaging service is included in all plans as standard. It's true, we're all hooked on text messaging. We send over 100 billion texts each year. And thats just in the UK. 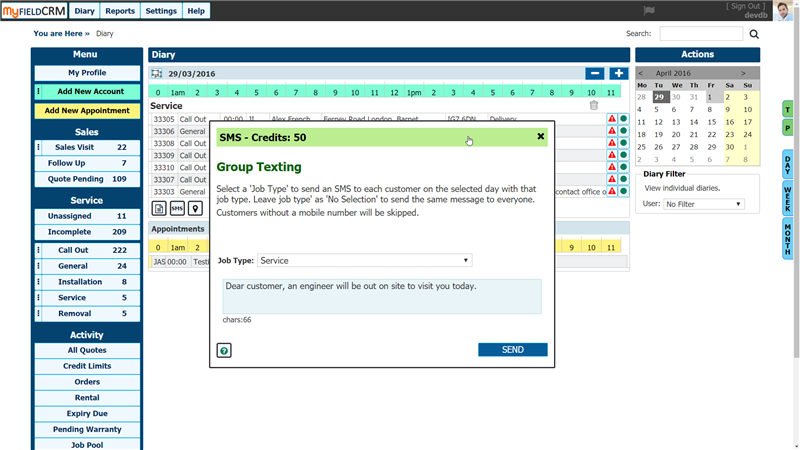 For that reason, it's also a very powerful marketing and alert system that we have incorporated SMS into MyField CRM. Text messages get read, when was the last time you ignored one?. Its one of the most certain methods of communication that you can be certain someone will actually see your message. From delivery alerts for your customers to informing your team of up coming tasks or events. text messaging hits the spot every time. Sending texts is a native task for your mobile device. 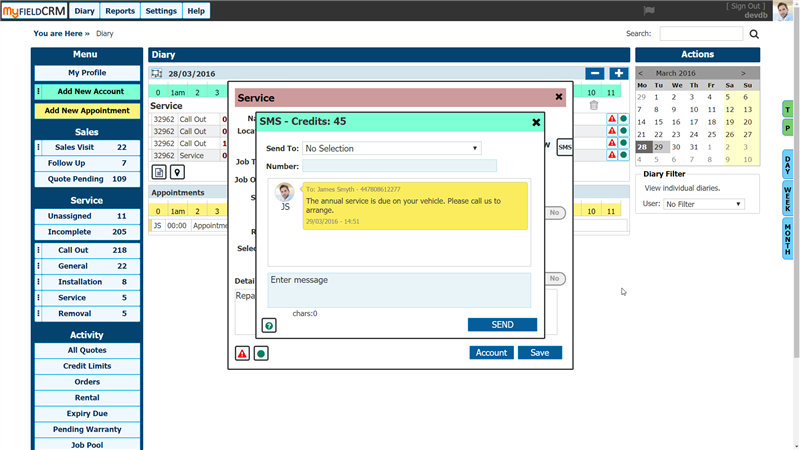 By using MyFieldCRM, not only can you sent the same text, it will automatically be logged with your customer record.